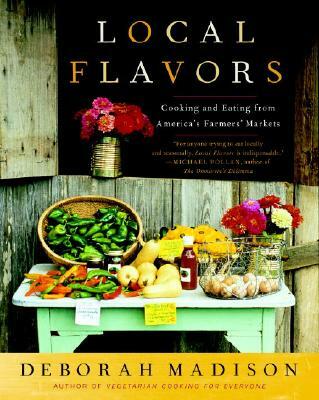 First published in hardcover in 2002, Local Flavors was a book ahead of its time. Now, imported food scares and a countrywide infatuation with fresh, local, organic produce has caught up with this groundbreaking cookbook, available for the first time in paperback. Deborah Madison celebrates the glories of the farmers’ markets of America in a richly illustrated collection of seasonal recipes for a profusion of produce grown coast to coast. As more and more people shun industrially produced foods and instead choose to go local and organic, this is the ideal cookbook to capitalize on a major and growing trend. Local Flavors emphasizes seasonal, regional ingredients found in farmers’ markets and roadside farm stands and awakens the reader to the real joy of making a direct connection with the food we eat and the person who grows it. Deborah Madison’s 350 full-flavored recipes and accompanying menus include dishes as diverse as Pea and Spinach Soup with Coconut Milk; Rustic Onion Tart with Walnuts; Risotto with Sorrel; Mustard Greens Braised with Ginger, Cilantro, and Rice; Poached Chicken with Leeks and Salsa Verde; Soy Glazed Sweet Potatoes; Cherry Apricot Crisp; and Plum Kuchen with Crushed Walnut Topping. Covering markets around the country from Vermont to Hawaii, Deborah Madison reveals the astonishing range of produce and other foods available and the sheer pleasure of shopping for them. A celebration of farmers and their bounty, Local Flavors is a must-have cookbook for anyone who loves fresh, seasonal food simply and imaginatively prepared. Deborah Madison, founding chef of Greens Restaurant in San Francisco, is the award-winning author of nine cookbooks, including The Greens Cookbook (her first), Vegetarian Cooking for Everyone, and her latest, Vegetable Soups from Deborah Madison’s Kitchen. She has received the M.F.K. Fisher Award, the International Association of Culinary Professional’s Julia Child Cookbook of the Year award, and three James Beard awards. In addition to writing on food and farming for such magazines as Gourmet, Saveur, Orion, and the blog Culinate.com, she has long been active in Slow Food (www.slowfoodusa.org) and other groups involved in local food issues. Before writing Local Flavors, she was a manager of her local farmers’ market in Santa Fe and served as a board member of the same market for twelve years. Although she now grows vegetables at her home in Galisteo, New Mexico, she is still an avid farmers’ market shopper and never goes anywhere without bringing home a big bag of the local bounty.